‘Mumbai Indians’ and ‘Trinidad and Tobago’ made their way into the semi finals. Next to Rajasthan, Mumbai Indians entered semis from group A. Whereas in Group B, ‘Trinidad and Tobago’ entered semi-final next to Chennai Super Kings. Today Mumbai Indians and Trinidad & Tobago were in the compulsion to win the match to qualify for semi-finals of Champion League Twenty20 of 2013 and they both made it. Both the team won the ‘do-or-die’ contest. Both the team, won the toss and made a good chase. In Semi-finals, these two teams won today, are going to face each other and Chennai is going to face Rajasthan. Today in the match between Mumbai Indians and Perth Scorchers, Mumbai won the toss and elected to field first. Perth’s team opening was made by Ashton Agar and the skipper of Perth Simon Katich. Agar made a good score of 35 and the skipper made 13 runs. Both of the openers were bowled out by Ojha. Sam Whiteman took Perth scoreboard to mark a decent score with his 51 runs in 32 balls which holds 2 sixes and 6 fours. Finally Perth innings end up with the score of 149/6 in 20 overs. Its not a big T20 score. In Mumbai bowling side, Nathan Coulter-Nile took 3 wickets whereas Ojha left with 2 wickets and Rishi Dhawan with 1 wicket. Mumbai Indians were set a target of 150. Dwayne Smith and Sachin Tendulkar were the openers came to the crease. Unfortunately Sachin gone without scoring any runs. But Smith stood and made a good score of 48 runs in 25 balls which holds 3 sixes and 5 fours. Next to Smith, Rohit Sharma played a good game and made the score of 51 in just 24 balls which holds 4 sixes and 3 fours. Finally, Rayudu stood with Sharma at the end to win the game. Rayudu made 14 runs in just 4 balls which holds 2 sixes. The winning shot is a six hit by Rayudu. Finally Mumbai made their way into the semi-final with this win. They won the match in just 13.2 overs. It was a great game played by Mumbai Indians. As like Mumbai Indians, Trinidad too won the toss and elected to field first. Openers of CSK batting are Michael Hussey and Murali Vijay. Hussey failed to prove him and gone for 1 runs. Next to Hussey, Vijay and Suresh Raina made a decent score of 27 and 38 runs respectively. Vijay with 4 boundaries and Raina with 3 boundaries. MS Dhoni is the next man to make a decent score of 25 in 25 balls with 2 fours. Other players gone for single digit scores. Finally Chennai innings end with 118 runs for all wickets down in 19.4 overs. In Trinidad bowling side, Rays Emrit took 3 wickets whereas Rampaul and Simmons took 2 wickets each. Other 3 wickets were run outs. T&T came into the crease with a easy target of 119. The opening was so good made by the players Lendl Simmons and Evin Lewis. Lendl Simmons made 63 runs in 41 balls which holds 5 fours and 4 sixes. Evis Lewis made 38 runs in 35 balls which holds 6 fours. These two openers took the game near to the target and finally other players Bravo and Ottley entered to score the little pending score to win the match. The T&T won the match in just 15.1 overs with 119/2. T&T won by 8 wickets. In Chennai bowling side, Raina and Ashwin took 1 wicket each. 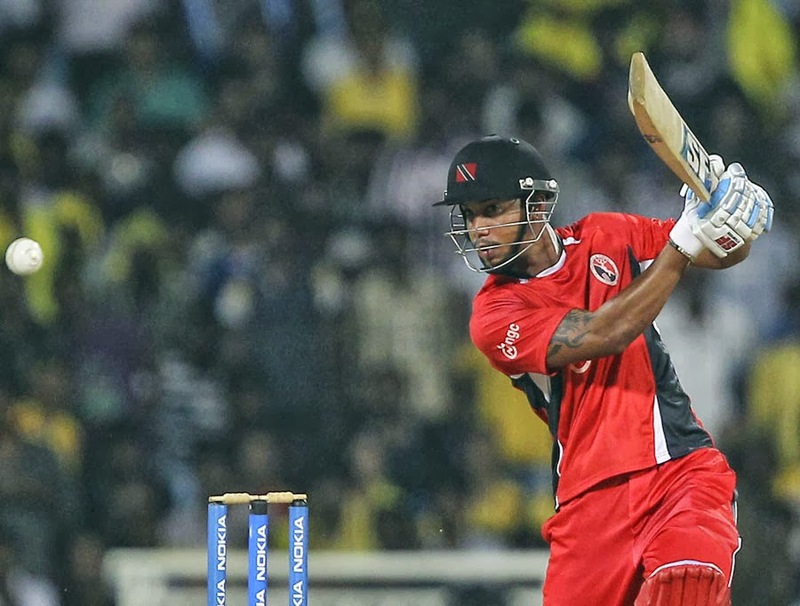 Thus Trinidad topped the table of the Group B by overtaking Chennai with run-rate. Finally three knock out match is going to take place to finalize the champions of CLT20 of 2013. How was these two matches? Who is expected to win the match. ?